The locations of defibrillators in Balbriggan and surrounds is as follows: (please help us to build on this list by emailing defibrillator locations to info@balbriggan.info for inclusion on this page. A defibrillator is a device that gives a high energy electric shock to the heart through the chest wall to someone who is in cardiac arrest. This high energy shock is called defibrillation, and it’s an essential life saving step in the chain of survival. If you come across someone who has had a cardiac arrest, it’s vital to call 999 and start CPR. Then you should find out if there is a defibrillator nearby. 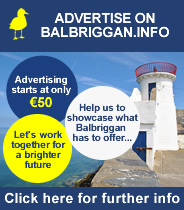 Balbriggan Clubs Community Centre, 23 Dublin Street, Balbriggan. St Patrick’s Church Hall, Stamullen. Lime Kiln. Main St, Julianstown Co.Meath. (On the wall at side of road.) Eircode: A92 PP23. Alverno House Laytown Co. Meath. Eircode: A92 PH49. Pat’s Centra Bettystown Co. Meath. (On the wall beside Pat’s & Rocco’s.) Eircode: A92 XN53. Harry’s Centra Mornington. Co. Meath. (Below Texaco sign) Eircode: A92 D9RP.